DGR conceived a set of caricature designs intended to form a pack of comic playing cards. Surtees asserts that there is no King of Spades, but rather there are two Knaves of Spades included (Surtees 1). 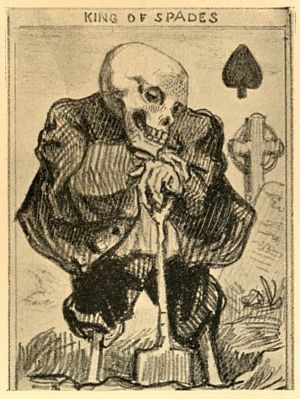 Marillier, in contrast, not only states the existence of a King of Spades, but includes a reproduction of that card ( Marillier 214). 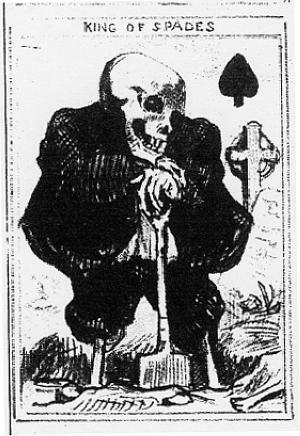 The King of Spades, according to Marillier, is conceived as “A figure of Death with a skeleton head, legs and hands, leans on a shovel in a graveyard” ( Marillier 215 ). The image here reproduced from The Bookman and Marillier, is from an 1846 lithograph. Surtees, A Catalogue Raisonné, vol. 1 (no. 4).